The wait is over. Per-mile insurance is now available in Pennsylvania! We are rewriting the rules of the road by introducing a totally new type of car insurance where the monthly bill is based on miles driven. Over 60% of drivers in Pennsylvania are considered low-mileage (drive less than 200 miles per week), and large cities like Philadelphia and Pittsburgh already have great public transportation and bike-friendly commute options. In fact, Philadelphia has more bike commuters per capita than any of the other ten biggest cities in the U.S. It is likely that Pennsylvanians who rarely drive are overpaying for car insurance, so we anticipate that pay-per-mile car insurance will be much-needed solution! We also plan to help Pennsylvanians become smarter drivers with our smart driving app. Insurance customers will receive the Metromile Pulse, a device that plugs into the car’s OBD-II port to deliver useful driving data and smart services. Pennsylvania is the second state on the East Coast where we offer per-mile insurance, and we have more planned on our roadmap. 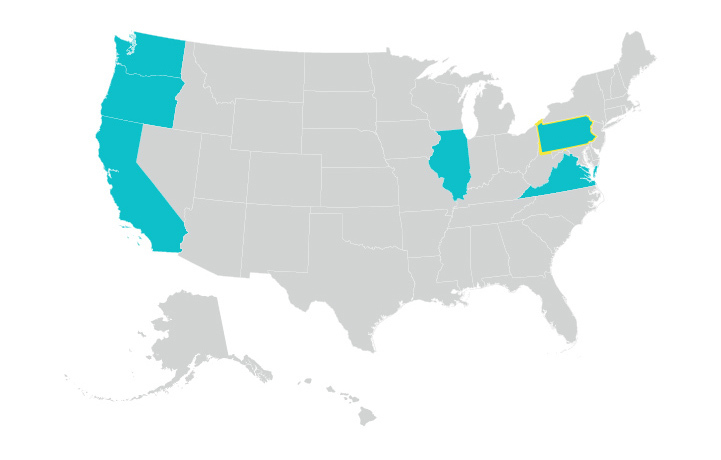 Sign up for our waitlist if you would like to be notified when we arrive in your state!